Microsoft Office package is one of the most widely used office suites. Its main components are Microsoft Word, Microsoft Excel and Microsoft Powerpoint along with some other office tools. Definitely it has some great features to lean for as it can make many of the office tasks quite a simple one with lots of features and tools provided in its package. Still one can think of various alternates available with similar and at times better features too. IBM Lotus Symphony is a suite of applications for creating, editing, and sharing text, spreadsheet, presentations and other documents and browsing the world wide web. It is distributed as freeware. At Zoho, software is our craft and passion. We create beautiful software to solve business problems. Over the past decade of our journey, the Zoho suite has emerged to be a leader in the cloud and on your devices. 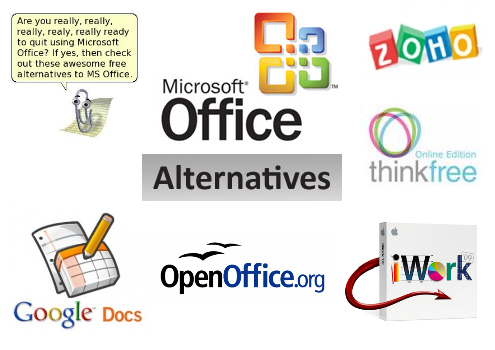 Thinkfree Office product family include Thinkfree Online which is the first MS-compatible web-based online office in the world, ThinkFree Office includes a word processor (Write), a spreadsheet (Calc), a presentation program (Show), and a WYSIWYG HTML and blog editor (Note).